Nigerian President Muhammadu Buhari, speaking from N’Djamena, the Chadian capital, has called for wider cooperation among countries of the Sahel and Saharan regions to counter the infiltration of small arms into Nigeria, flowing into the hands of militia forces, bandits and insurgents who are becoming a threat to human rights and internal security. The Senior Special Assistant to the President on Media and Publicity, Garba Shehu, in a statement, said Buhari made the call at the one-day Extraordinary Session of the Conference of Heads of State and Government of the Community of Sahel-Saharan States, CEN-SAD, alongside his host and current Chairperson of CEN-SAD, Idriss Deby Itno and their counterparts from Niger and Togo, with high-level representations from other member-countries. Nigeria under the President has worked closely with immediate neighbours in the last few years to stem the widespread availability of small arms and light weapons making their way into Nigeria, but Buhari said the “very disturbing recent developments” have impelled the administration to seek support from a wider circle of countries if the illegal inflows are to be curtailed. He is also seeking cooperation to address is the problems of irregular migration, trafficking in persons, especially of women and children as part of the security nature of his engagements. According to him, the significance of the regional organization and the role it can play in furthering domestic security was what prompted the reinvigoration of the nation’s interest, which led to the approval of the payment of the backlog of unpaid funds and for a speedier work on the processes of the ratification of the treaty binding the members of the organization. 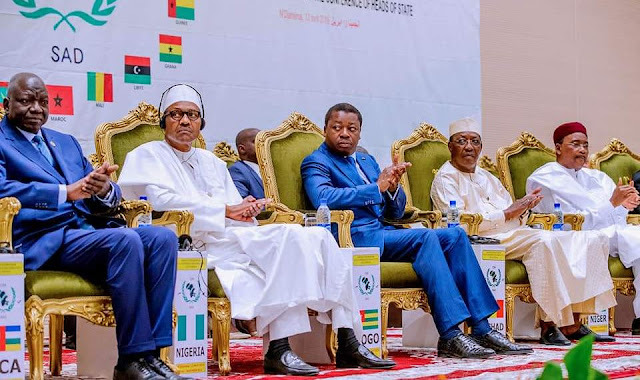 President Buhari is pressing for the protection of the large Nigerian community living legally and illegally in Libya, the host country of the CEN-SAD Secretariat.